This is a pigment based (UV stable & water resistant*) yellow ink cartridge for use in the SwiftColor SCL-4000P and SCL-8000P printers. 240ml capacity. 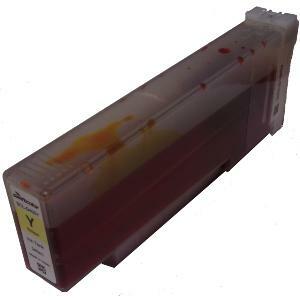 Please click the links below for more information on this ink cartridge. #PERFORMANCE#Pigment-based ink provides increased resistance to fading caused by UV exposure. Pigment-based inks typically produce a slightly duller, less vibrant finish compared to dye-based inks. Pigment-based inks are recommended for use when an increased level of print durability and longevity is required. Pigment-based ink has a superior resistance to water meaning labels printed with pigment ink are less likely to bleed or run if exposed to water or other fluids including condensation caused by refrigeration processes. We recommend testing the performance of labels printed using pigment-based ink with your specific application before purchasing ink or labels in large quantities or applying many labels to your products. KTEC take no responsibility for any label fading or ink bleeding issues you may experience as a result of using this ink cartridge with your specific application. #COMPATIBLE MEDIA#The pigment ink in this cartridge is compatible with a limited range of label media, typically it is essential that only matt media is used both in paper and synthetic form. Pigment inks usually fail to cure (dry) properly on gloss or semi-gloss media. The ink in this cartridge is not compatible with thermal transfer label media or any media which does not have an inkjettable top-coat.